Minister Chakramon Phasukavanich (2nd from right) of Thailand's Ministry of Industry poses with Thai Ambassador to Seoul Kulkumut Singhara Na Ayudhaya (right), Acting Sec. 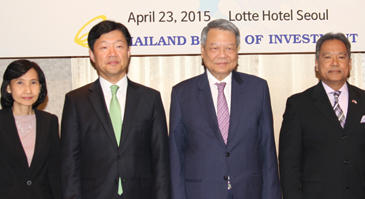 Gen. Hirunya Suchinai (left) of Thai "Office of the Board of Investment (B0I). Second from left is Deputy Minister Woo Tae-Hee of South Korea's Ministry of Trade, Industry, & Energy. 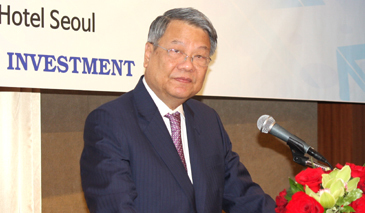 Thai Ambassador to Seoul Kulkumut Singhara Na Ayudhaya hosted a seminar under the title of "New Investment Promotion Strategies: Towards Sustainable Growth" at Lotte Hotel on April 23 (Thursday), 2015. Over 200 South Korean businesspeople and local media were invited to the Thai investment seminar held on the third floor of the hotel from 9:30 a.m. till 1:30 p.m. on the day. 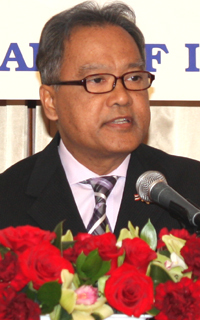 Among the key participants were Minister Chakramon Phasukavanich of Thailand's Ministry of Industry, Acting Sec. Gen. Hirunya Suchinai of Thai "Office of the Board of Investment (B0I)," Minister-Counseller Worakan Kosolpisitkul of BOI's Seoul Office, President Lee Man-Jae of Korean-Thai Chamber of Commerce in Bankok, Deputy Minister Woo Tae-Hee of South Korea's Ministry of Trade, Industry, & Energy. The Thai envoy welcomed all the attendees by delivering a congratulary speech at the seminar. "For the past 57 years Thailand and South Korea have enjoyed very close ties," he said in his speech. "In 2012 leaders of the two countries agreed to enhance our relations to a stragetic partnership"
He also mentioned that the feasibility study was launched for Comprehensive Economic Partnership Agreement (CEPA) between Thailand and South Korea. "Thailand ranks No. 1 among ASEAN countries for Korean tourists," he said. "More than 1 million Koreans travelled to Thailand in 2014"
He added that the total trade volume between Thailand and South Korea reached 13 billion US dollars. The envoy also introduced Thailand's seven-year Investment Promotion Strategy, launched early this year and aimed at increasing Thai competitiveness by providing investment incentives to foreign companies. He also stressed the importance of expertise of Korean industries in Thailand's efforts for inducing Korean investment. "The two countries are striving forward to reach the trade target of 30 billion US dollars in 2017," he added. While emphasizing the rise of South Korea's foreign direct investment (FDI) into Thailand, "the total net applications from South Korea to the Board of Investment of Thailand surged 4.6 times to about 566 million US dollaars last year from the previous year's 121 million US dollars"
Another congratulatory speech was made by Deputy Minister Woo Tae-Hee of South Korea's Ministry of Trade, Industry, & Energy. In his speech the deputy minister emphasized the long-lasting mutial ties betwen Thailand and South Korea. He said that there are some 300 South Korean companies operating in Thailand, which he called "an attractive nation with some 68 million population. A keynote speech was made by Minister Chakramon Phasukavanich of Thailand's Ministryh of Industry under the title of "New Investment Promotion Strategies: Towards Sustainable Growth." 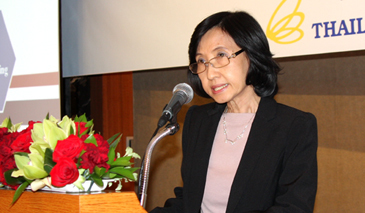 "Thailand is a free and an open market for foreign investment," the minister stressed. He argued that foreign companies in Thailand can enjoy various attractive benefits including tax exemptions. Acting Sec. Gen. Hirunya Suchinai of Thai "Office of the Board of Investment (B0I)" also delivered a speech. In her speech she mentioned the active role of South Korean companies in Thailand. She also mentioned a variety of benefits and incentives including corporate income tax exemption and exemption of import duty for foreign companies operating in Thailand. Asked about a question by a local journalist regarding what makes South Korea to be an attractvie potential investor, she gave out three reasons. She explained that they are the advanced technology of South Korean companies particularly in IT and R&D areas, well-developed movie-related industry including animation and graphics, and the highly developed machine-related industry. President Lee Man-Jae of Korean-Thai Chamber of Commerce in Bankok was the last speaker at the seminar. Lee gave an overall explanation about Thailand and about Korean companies operating in Thnailand. He mentioned the influence of Thai people of Chinese origin in the local Thai economy, calling the nation a "hub" of auto industry in Southeas Asia region. In the year 2013 Thailand produced a total of 2.45 million units of vehicles, making automobiles and motorbikes No. 1 export item of Thailand.